"The Night Before" was written entirely by McCartney and recorded on February 17, 1965 at Abbey Road studios. McCartney plays bass and sings lead vocal. Lennon plays electric piano, Harrison lead guitar, and Starr the drums. Lennon and Harrison provide backing vocals. 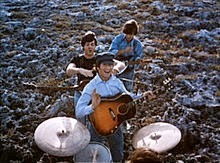 The song is performed in Help (lip-synced) on Sailsbury Plains.